The size of the container is important and a container at least 18" deep and wide is ideal. You need to provide adequate drainage holes and to add plenty of crocks, stones or gravel in the bottom and stand the container on stands to allow good airflow . The best compost is John Innes No.3 and if the pot is large and you need to bulk it up then you can add up to a quarter of peat or peat substitute. When you plant, as in the open ground, bury the first pair of shoots/nodes below ground level. Water regularly and be sure that the pot is draining well. This is important in the winter months to ensure the pot does not become water-logged. If you have chosen a large flowering cultivar to plant in a container then this needs to be planted with 4in of stem below the surface level of compost. All the other species need only 1in of stem planted below top of compost. 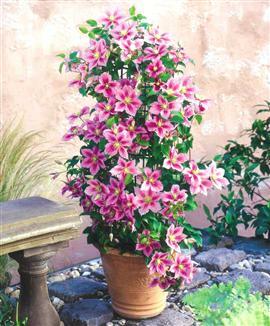 The Herbaceous and evergreen clematis do not need to be planted deeply. If the rootball is dry then soak in water for 30 minutes before planting. We often plant two clematis in the same pot to demonstrate clematis as patio planters for flower shows, but for long term performance and maintenance it is best that they both belong to the same pruning group. From late spring to early autumn we recommend using liguid tomato feed once a week. Tomorite or Tomato Maxicrop used at normal strength will improve the colour, size and quantity of our clematis blooms. To keep these clematis compact, ignore the 'normal' pruning instructions. Hard prune in February/March and prune again hard after the first flush of flowers has finished. Also at pruning time remove an inch or two of compost from the top of the pot and replace with fresh compost to which a handful of bonemeal has been added, and water in. Every four to five years root pruning will become necessary. At pruning time when the plant is dormant cut away 10cm of root from the outside of the rootball and the same from the bottom of the rootball, and then re-pot.